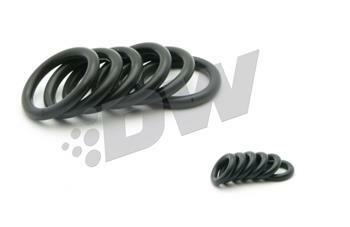 DeatschWerks Fuel Injector O-Ring Kits UNIVERSAL - MiataRoadster - Stay tuned with MiataRoadster! DeatschWerks offers three different types of O-ring kits – Subaru-specific O-ring sets, Replacement O-ring sets and Full O-ring Kits. 1) Subaru sets (PN’s 2-001-4, 2-002-4) include all necessary upper O-rings, lower O-rings, manifold spacers and seals needed for your application. 2) Replacement sets (PN’s 2-000-4, 2-000-6, 2-000-8) include all necessary upper O-rings, lower O-rings, manifold spacers and seals needed for DeatschWerks injectors only. WHEN ORDERING A REPLACEMENT SET, YOU MUST PROVIDE A SPECIFIC DW INJECTOR PART NUMBER IN THE “COMMENTS” WHEN YOU CHECK OUT. 3) Full kits (PN’s 2-201, 2-202, 2-203) offer a large selection of many different types of O-rings to fit most late model vehicles.